Where can I buy Heritage Meat Company sausages? I mentioned in a comment to a post that the Chaffers Street Market in Wellington has some great food stalls – I’m not talking about the City Market in the Herd Street Building, although that too showcases some great produce. Amongst the market garden fruit and veges there are egg producers, great herbs, olives, breads, wood fired pizza, and sausages. The sausages come from the Heritage Meat Company in Marton and while they sell vacuum packed packs of snarlers they also cook their wares and sell them in nice Pandoro rolls with ketchup and mustard. Cost $5. Try and then buy. It’s a good idea. Our household buys a dozen or so each week. We have had the French sausage and the Romanian. This last Sunday I bought a classic Beef Banger. The Beef Banger is quite rich in taste with a solid texture. 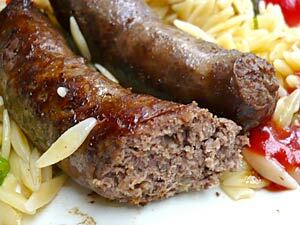 Their claim of no fillers is bang on the money – these sausages will fill you up, and only with good quality ground meat. They do tend to produce a lot of fat but this will come off in the cooking/frying. I can highly recommend them. Being an artisan product the batches can vary, so be prepared to get a slightly different taste each time from the same sausage. Tonight we’ve just had a Heritage Meat Co. beef fillet, bought from the market. Outstanding. Hi Kev, I didn’t know they did beef fillets. Did you buy it from the market in Wellington, by Chaffers Street? Yep, bought it last weekend. They had a few different cuts of meat, along with their sausages. It was vacuum packed, trimmed of fat & silver skin, competitively priced and melt-in-your-mouth tender. Beautiful.